Visions about migration - problems; the pros and cons of migration; experiences of joy and pain of migration; , external and internal migration; men and women in migration; the life of migrants and their families; combatting human trafficking; solutions to migration issues and problems in Kyrgyzstan. Previously published works are not accepted to the competition! 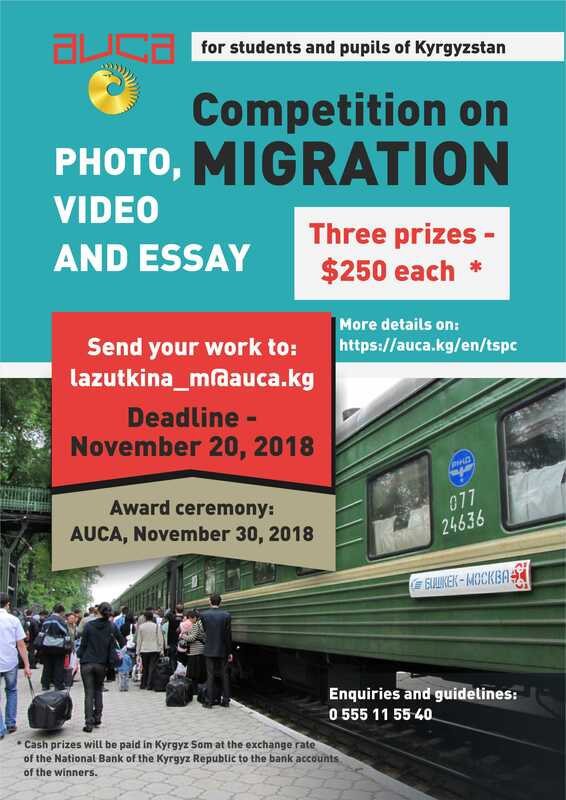 Essays, photos and videos will be judged on their relevance and importance, on the originality of the solutions offered by the author to migration problems. The winners will be selected by a competent jury composed of representatives of the State Migration Service under the Government of the Kyrgyz Republic, the Office of the International Organization for Migration in Bishkek and NGOs. Cash prizes will be paid in Kyrgyz Som at the exchange rate of the National Bank of the Kyrgyz Republic to the bank accounts of the winners. In each of the 3 categories, the jury will select one winner. The best works will be awarded with cash prizes - the winner in each of the three categories will receive $250 USD. The award ceremony will take place at the National Student Round Table on Migration organized by TSPC AUCA on November 30, 2018 at AUCA. The works of the winners and the most interesting works of other participants will be shared on the AUCA website and in social networks (AUCA and TSPC pages), and presented as a slide show on the AUCA LED screen during the round table. The deadline for submission of works is November 20, 2018. For further information, enquiries, and submissions, please e-mail lazutkina_m@auca.kg. TSPC AUCA (https://auca.kg/ru/tspc/) is an innovative, non-profit analytical organization working in the field of research, analysis, development of sound and effective approaches to solving the most pressing problems of public life in the countries and communities of Central Asia.TSPC AUCA implements projects on such topics as good governance, environmental protection and sustainable development, promotion of human rights, migration management.The competition for the best photo, video and essay on migration is held within the framework of the TSPC AUCA project “Creating a favorable environment in the Kyrgyz Republic for developing effective migration policy: promoting capacity development of state migration authorities and initiating education in the field of migration in the Kyrgyz Republic”.